Practice Microwave Engineering questions and answers for interviews, campus placements, online tests, aptitude tests, quizzes and competitive exams. This set of Microwave Engineering Multiple Choice Questions & Answers (MCQs) focuses on “Antenna Radiation”. Explanation: Isotropic source radiates energy in all the direction uniformly. For such a source, the radial component Sr of the pointing vector is independent of θ and φ. The three dimensional power pattern of n isotropic source is a sphere. 2. Antennas that radiate energy only in a specified are called anisotropic antennas. Explanation: All physically realizable, simplest antennas also have directional properties. That is, they radiate energy in one direction than in any other direction. Such sources are called anisotropic point sources. Explanation: The pointing field vector for an isotropic source is given by the expression P/ 4πR2.P is the total power radiated y the source. As the distance of the point from the source increases, the magnitude of pointing vector decreases. Explanation: To find the directivity of the given source, the power radiated by the given source is found out by the method of integration. Taking the ratio of the power radiated by the given source to the power radiated by an isotropic source gives the directivity. Following the above steps, the directivity of the given source is 4. Explanation: Given the directivity of unidirectional power pattern, the directivity of bidirectional power pattern is half of it. Hence the directivity of the source is 2. Explanation: To find the directivity of the given source, the power radiated by the given source is found out by the method of integration. Taking the ratio of the power radiated by the given source to the power radiated by an isotropic source gives the directivity. Following the above steps, the directivity of the given source is 1.27. Explanation: To find the directivity of the given source, the power radiated by the given source is found out by the method of integration. Taking the ratio of the power radiated by the given source to the power radiated by an isotropic source gives the directivity. Following the above steps, the directivity of the given source is 1.5. Explanation: To find the directivity of the given source, the power radiated by the given source is found out by the method of integration. Taking the ratio of the power radiated by the given source to the power radiated by anisotropic source gives the directivity. Following the above steps, the directivity of the given source is 6. 9. Considering distance as a parameter, two types of field zones can be defined around an antenna. Explanation: Considering distance as a parameter, two types of field zones can be defined around an antenna) .The field near the antenna is called near field or Fresnel region and the other region is the far field that is also called as Fraunhofer region. Explanation: The received power by the antenna is given by E2Ae/Zₒ. Substituting the known values in the above equation, the power received is 1.06×10-15 watts. 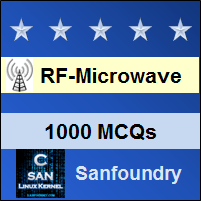 Sanfoundry Global Education & Learning Series – Microwave Engineering. To practice all areas of Microwave Engineering, here is complete set of 1000+ Multiple Choice Questions and Answers.